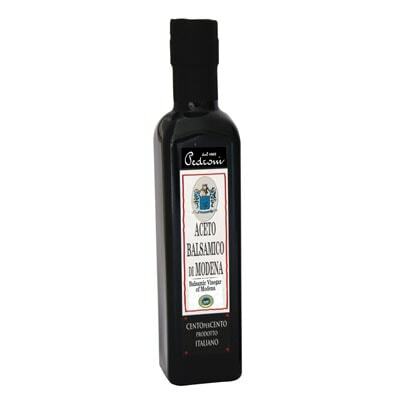 Balsamic Vinegar, Cento per Cento comes from one of the best producers of traditional balsamic vinegars in the Modena area. They use old traditional techniques in the cultivation, harvest, and processing of the grapes used in this exquisite condiment. This culinary elixir is IGP Certified and made with grape must, and only grape must. The must consists of crushed Lambrusco grapes that undergoes a heating process that reduces its liquid content. After that, it undergoes a complicated aging process that involves transferring it to several wooden barrels over a period of time. In fact, each balsamic vinegar has some of the first batch Acetaia Pedroni has ever created, which is about 150 years old. And with zero preservatives, additives, and coloring agents, it is a 100% natural artisanal condiment. Certainly a great addition to any kitchen and will undoubtedly enhance every dining experience. I love that this does not have preservatives, additives, and coloring agents in it. So natural that is why i brings out the flavor of every dish.